If this happens, try to determine if there has been a change in the household, such as visitors, renovations, a new baby, going on vacation, you having an illness, a change in your routine, etc. All of these seemingly inconsequential changes are stressful to your feline and can have profound effects on their behavior. 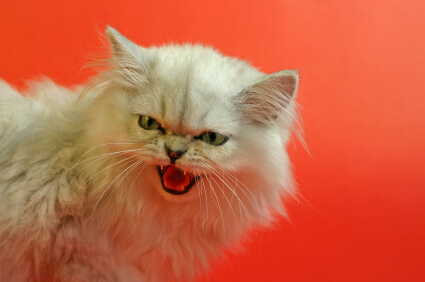 Aggression following a separation between your cats, such as after a cat returns home from a visit to the veterinarian, can cause non-recognition aggression. Redirected aggression can be caused when one cat is startled by an external stimulus, such as seeing an intruding outdoor cat through a window, and attacks the other as a result of agitation. Most of these situations can be remedied by separating the cats with time to cool down followed by a gradual reintroduction to each other paired with positive experiences and things that will provide pleasure, such as affection, toys, catnip and/or treats. Before reintroducing your cats, dab a spot of cologne or dust a light layer of a scented dusting powder on them. This helps because all of the cats have similar scents. Many times, cats quibble over territory. Most cats prefer a little place to call their own, so find out where each cat likes to spend the bulk of time and make it a safe haven with a cat bed, some food and water, maybe a scratching post or cat tree and, if possible, a litterbox. If your felines are having a hard time getting along, it is very important for you to keep your body language and tone of voice relaxed and playful. Keep it light and say something like, “Come on silly kitties. Be sweet!” A soothing response on your part can help defuse the situation. If your cats are hissing and tense, try distracting them with a toy, such as a laser pointer or a fishing pole. You can also toss treats or catnip near the kitties and speak in a relaxed tone - the key is to provide something distracting and enjoyable for the kitties. Do this as often as possible - the more positive time cats spend together, the better. There are a number of products on the market that copy a cat’s facial pheromone and create familiarity in the cat’s surrounding, and they can help crabby cats during stressful situations. They are available as a plug-in or a spray. How long it will take for these methods to reduce fighting and tension in your multi-cat household depends on several factors, including the size of the meltdown and how long the problem has been going on. For severe cases, there are medications available to help your cat cope, so talk to your family veterinarian to find the method that works best for your cat. 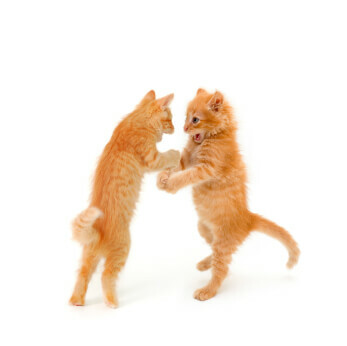 What do you do if you witness an actual cat fight between your beloved felines? The most important thing to remember is never attempt to breakup the fight by handling the cats. In the ruckus, one or both of your cats can injure you with painful bites or deep scratches which can become infected and require antibiotics, sutures or surgery, or lead to a condition called Cat Scratch Fever. Cats are quick and powerful and in a cat fight, seconds count. To break up the fight, try tossing a jacket or blanket on top of them, or throw a soft pillow in their direction. Striking a section of rolled-up newspaper against something also works, as the sudden sound startles them. If you have a history of cat fights in your home, you should keep a stash of newspaper available. As a last resort, sprinkling them with water will always break up a fight. As soon as they are separated, close them in separate rooms to allow them to cool down. Once they are calm, gently assess them for signs of bleeding or swelling. Approach them slowly and speak in a soothing manner. It is also important to examine your cats for two days following the fight as well, as abscesses can develop 24-48 hours after the fight. If you find any wounds, call your family veterinarian. My sincere hope is that by following some of these suggestions, cooler heads will prevail in your multi-cat household. Note: If you missed the first post on Feline Aggression, you can read it here.